This article first appeared in The Edge Financial Daily, on October 25, 2017. KUALA LUMPUR: The local takaful insurance sector should widen its range of products to increase market penetration, International Centre for Education in Islamic Finance (Inceif) president and chief executive officer (CEO) Datuk Dr Mohd Azmi Omar said. 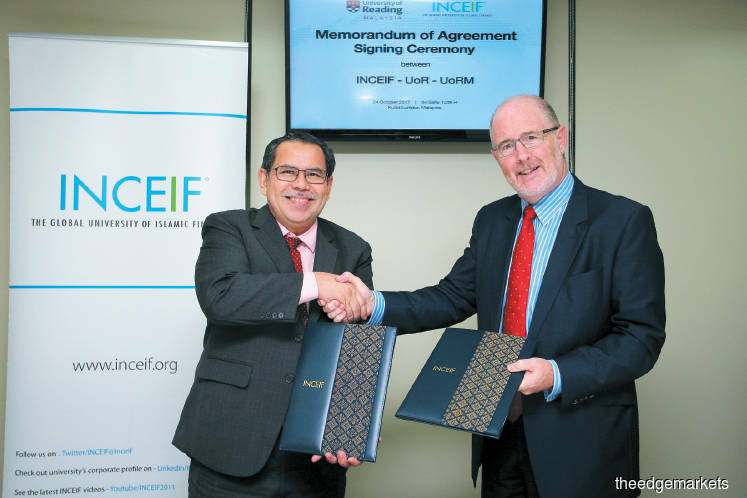 “We need to diversify [takaful products] and have more innovative products available in the industry, to increase the penetration rate and market share of the sector in the country,” he told reporters after the signing of a memorandum of agreement (MoA) between Inceif and University of Reading and University of Reading Malaysia yesterday. “In Malaysia, we have moved beyond just the banking industry in Islamic finance and we are now looking at the incorporation of financial technology within the sector. We want to make Islamic finance an alternative financing solution to the mainstream insurance options in Malaysia,” he said. He noted that currently, the penetration rate of Islamic finance in banking activities is nearly 40% locally. The takaful insurance sector, with a 15% penetration rate, is the highest in the world. “We still have the highest penetration rate in the world, but I believe we can do more to nudge this number higher. More should be done to improve the takaful industry such as increasing human capital, providing more syariah support, as well as seeing how the government can provide more incentives to support the sector,” Mohd Azmi said. The MoA, meanwhile, is to signify the three aforementioned parties’ collaboration in fostering opportunities for research, providing academic publications and other materials, as well as intellectual enrichment opportunities for the staff and students at the education facilities. “We hope to produce graduates with strong Islamic finance background. So, this collaboration is very important to us, and we hope there will be more collaborations in future so that Malaysia will be viewed globally as a key hub for Islamic finance,” Mohd Azmi said.